Part Used & Method for Pharmaceutical Preparations: The roots are dug in summer or autumn. After the fibrous roots have been removed, the roots are washed in boiled water and the bark peeled off. Then the roots are soaked again before being cut into pieces or slices. Functions: 1. To clear the lungs and tonify yin; 2. To strengthen the stomach and promote the production of body fluids. 1. Deficient yin of the lungs with heat manifested as dry cough or cough with scanty sputum, hoarse voice from a chronic cough, dry throat and thirst. Glehnia root (Shashen) is used with Ophiopogon root (Maidong) and Tendrilled fritillary bulb (Chuanbeimu). 2. Body fluids consumed by febrile diseases manifested as dry tongue and poor appetite. Glehnia root (Shashen) is used with Ophiopogon root (Maidong), Fresh rehmannia root (Shengdihuang) and Fragrant solomonseal rhizome (Yuzhu) in the formula Yiwei Tang. Dosage: 10-15 g (15-30 g for the fresh herb). 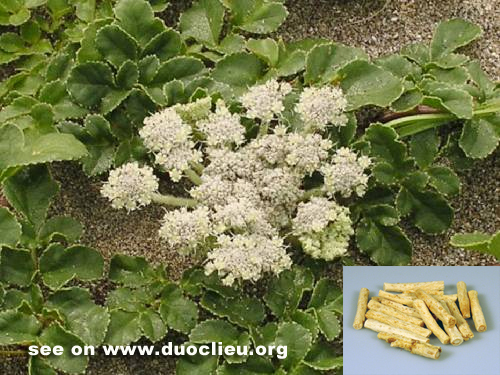 Cautions & Contraindications: This herb is contraindicated in cases with deficient cold syndrome. Also, it counteracts the herb Black false bellebore (Lilu).